To me Halloween and cupcakes just go together. 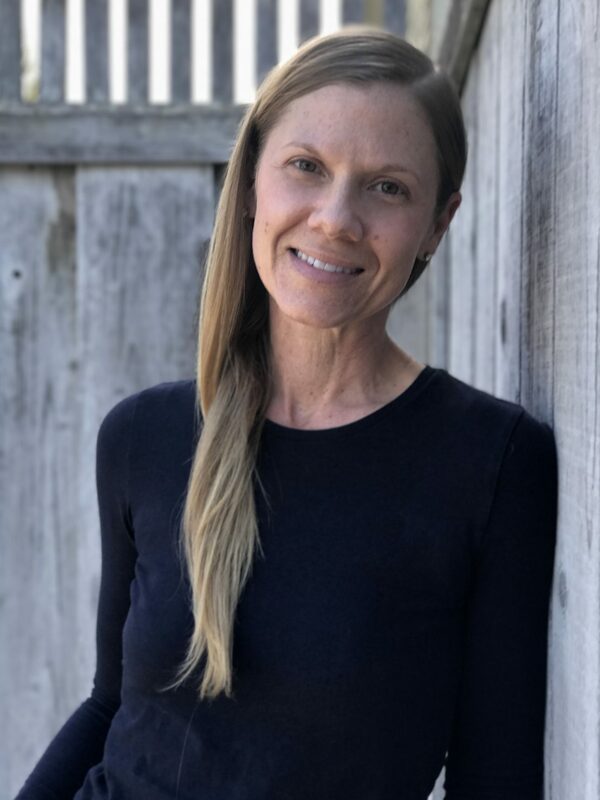 Maybe that’s because I’m a mom, maybe that’s because cupcakes are easy, maybe that’s because these individual cakes fill the need of a small(ish) sweet treat when you’re the parent responsible for snacks at the school class party. Whatever the case, I like cupcakes and I like to make them for Halloween. Halloween is a bit of a crazy holiday. I would say I have a love-hate relationship with it, actually. My boys become slightly obsessed in the days leading up, have boundless energy the day of, and become fixated on who will collect the biggest haul of candy, all on what normally seems to be a school night. It’s a lot. All that said, I loved Halloween as a kid and I try to make it fun for my boys, without going overboard. 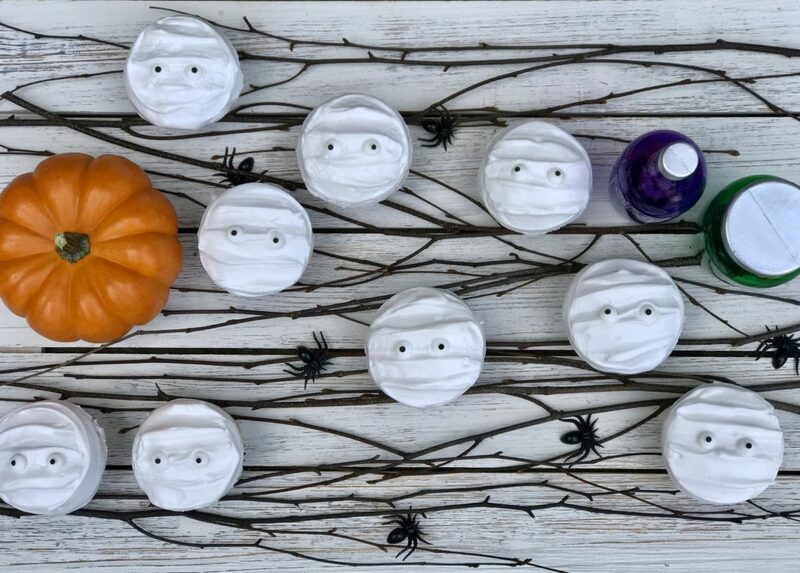 While I admire over-the-top Halloween décor, it’s not my thing. We don’t lavishly decorate our house on the holiday; I’m more about subtlety. Not that there’s anything wrong with holiday decorations. I enjoy them very much; particularly looking at them on someone else’s house. These are my simple and subtly decorated Halloween-themed cupcakes, or mummy cakes as I call them. If your child has been in a class with either of my boys in the elementary school years, chances are, you have seen them or had one yourself before. I’ve made thousands of them. 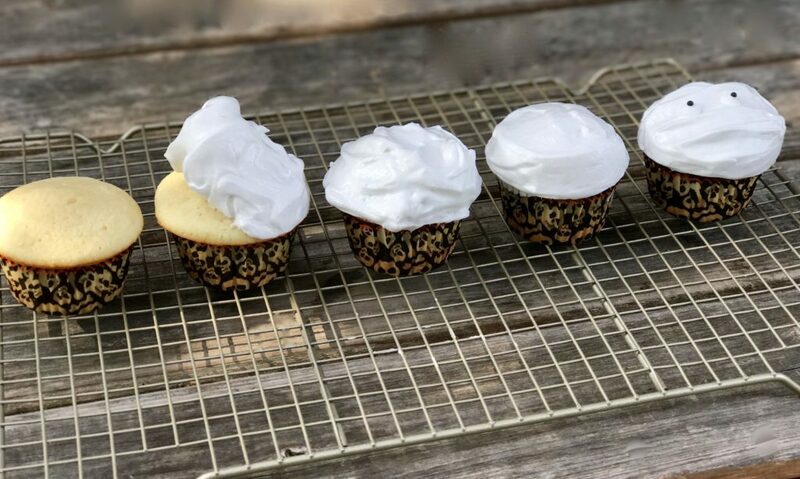 The great thing about this recipe is that it’s a cake recipe; a good cake recipe can almost always make a good cupcake as well. I did an Easter cupcake post back in April, which had my favorite olive oil chocolate cake recipe in it. 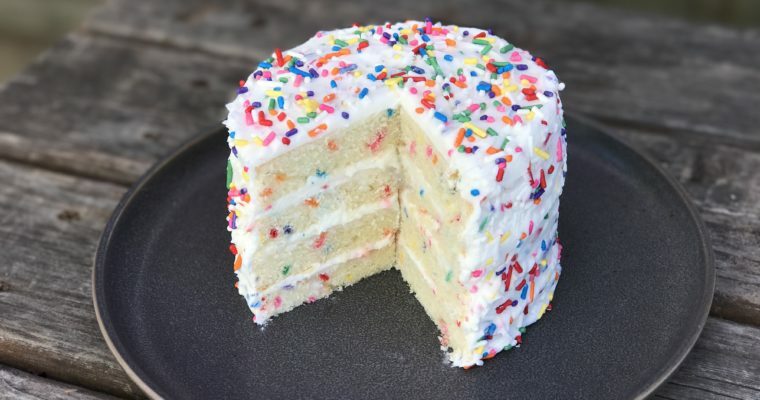 So if vanilla cake is not what you want, that one is super moist and another great option. For my mummy cakes I use one of my favorite recipes from Magnolia Bakery In New York. Now in Los Angeles and Chicago too, Magnolia is worth the lines that often form outside. This is an old-fashioned, light, flavorful vanilla cake with fluffy frosting made from egg whites and it’s super easy. I have adapted the original recipe only slightly. 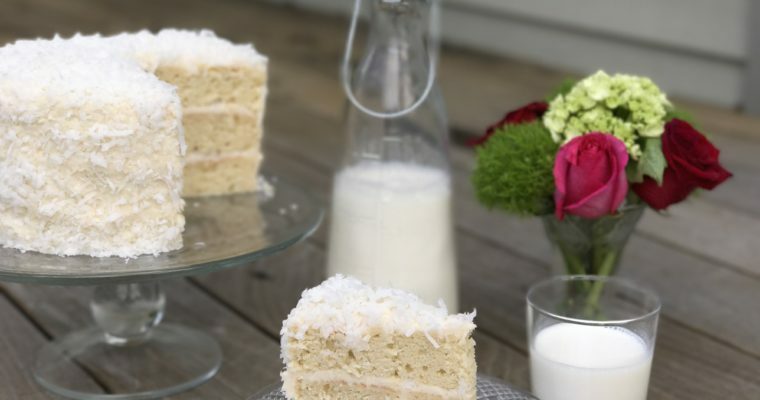 Magnolia uses this recipe for their coconut cake and you can find it in their fabulous book Magnolia Bakery Cookbook. I already have my own special recipe for coconut cake which I prefer, but I think this recipe is just prefect for these cupcake. 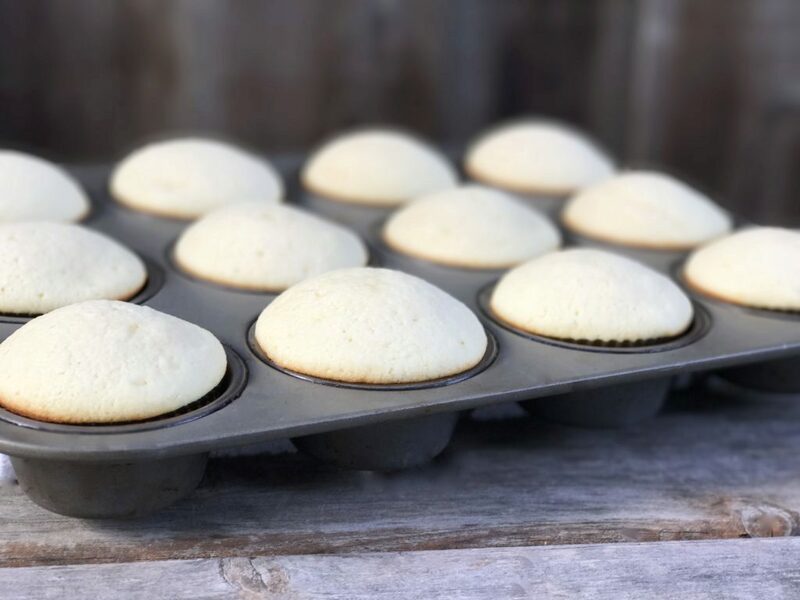 A small off-set spatula allows you to smooth out the cupcake frosting and make the little streaks in the frosting for the “mummy-like” appearance. 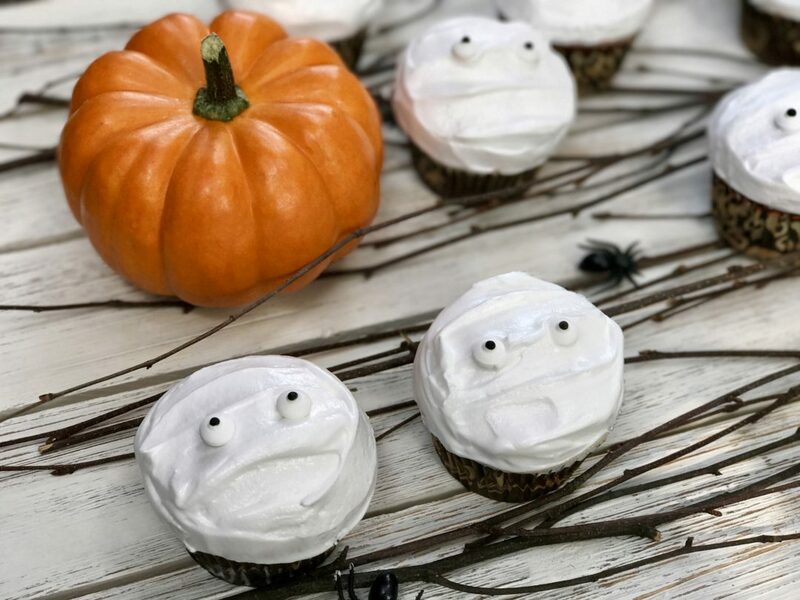 Top with some Wilton decorative candy eyeballs and you have an easy, cute and delicious Halloween cupcake that are not to time-consuming. Step 1 Preheat the oven to 350 degrees F. Line muffin tins with baking cups and set aside. Step 2 In a medium bowl, add the flour, baking powder, sand salt, mix well to incorporate. 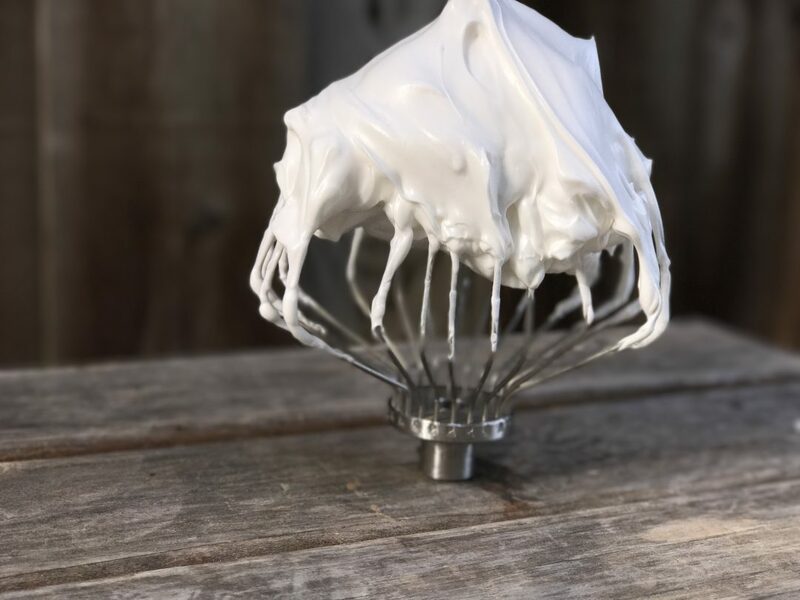 Step 3 In a large bowl of a kitchen mixer, such as a Kitchen Aide fitted with a whisk attachment, add the butter and sugar and beat on medium unit smooth and fluffy, about 2-3 minutes. Step 4 Add the eggs, one at a time, mixing well to incorporate. Add the vanilla. Step 5 With the mixer on low, add the flour mixture and the milk, alternating. Mix well to blend. Step 6 Divide the batter and pour into the prepared muffin tins. Step 7 Bake for 25 minutes, or till a cake tester comes out clean. Step 8 Allow to cool slightly before removing from the tins and frosting. Step 1 In a the bowl of an electric mixer such as a Kitchen Aid, fitted with a whisk attachment, add the egg whites and the vanilla extract. Do not mix, let sit. Step 2 In a medium saucepan add the water, sugar and cream of tartar and place over medium-high heat and bring to a boil stirring once or twice. Boil for about 1-2 minutes to dissolve all the sugar. Remove from the heat. Step 3 Going back to the mixer, turn on to medium speed and beat the egg whites for about 1 minute, till frothy. Step 4 With the mixer still running, add the warm sugar mixture in a slow steady stream. Continue to beat constantly, on medium high-speed for about 5 minutes or until stiff peaks form and the frosting is creamy. Use frosting right away.